And now we’re in the Top 32! It’s Single Elimination from here on out! Darren Stephenson, from Newcastle UK ended Swiss in 4th place with a record of 8-2 with Pendulum Magicians. 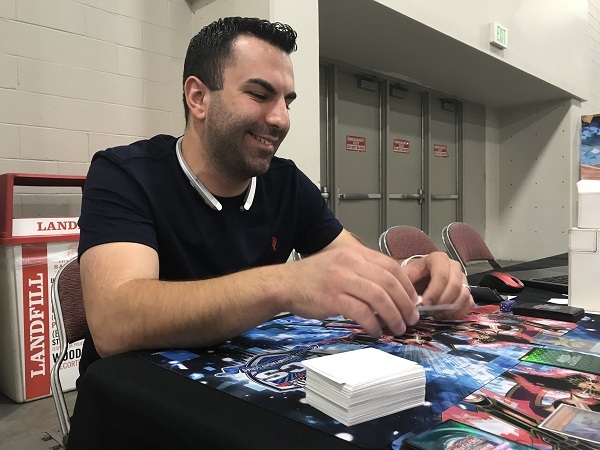 He’s up against the 29th seed, Tamir Brown from Peoria, Illinois who ended Swiss with a record of 7-2-1 with Burning Abyss! It’s the Deck that doesn’t know when to quit! Tamir’s Deck contains 60 cards including 3 copies of Galaxy Worm from Code of the Duelist which can Special Summon another copy of itself when it’s Normal Summoned, allowing for even more ways to Xyz Summon Dante, Traveler of the Burning Abyss! Who will be going on to Top 16? It’s time to Duel! Brown won the roll and elected to go first. He started with a hand of Radian, the Multidimensional Kaiju; Cir, Malebranche of the Burning Abyss; Gadarla, the Mystery Dust Kaiju; Soul Charge; and Fiendish Rhino Warrior. He started with a Special Summoned Cir, then a Normal Summoned Fiendish Rhino Warrior, then he used the 2 monsters to Xyz Summon Dante, Traveler of the Burning Abyss! He used the effect to send Pot of Desires, Raigeki, and Ghost Ogre & Snow Rabbit to the Graveyard (ouch). He used the effect of Rhino Warrior to send Scarm, Malebranche of the Burning Abyss from the Deck to the Graveyard. He then activated Soul Charge! He Special Summoned Fiendish Rhino Warrior, Ghost Ogre & Snow Rabbit, and Scarm, Malebranche of the Burning Abyss from the Graveyard and lost 3000 LP. (Scarm wasn’t destroyed by Fiendish Rhino Warrior’s effect.) Brown then sent all 4 monsters to the Graveyard to Link Summon Saryuja Skull Dread! 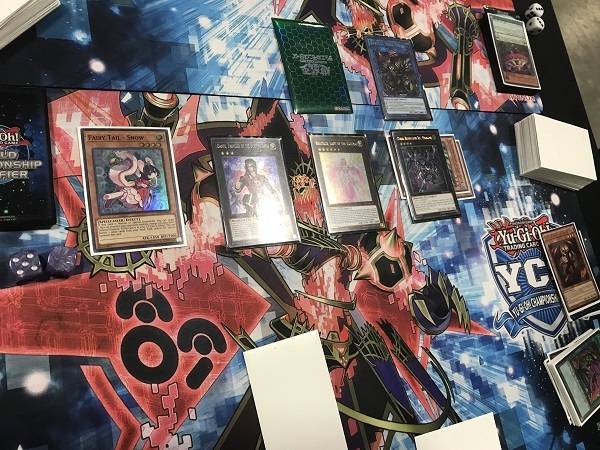 He used Dante to get Cir, Malebranche of the Burning Abyss back from the Graveyard and then resolved Saryuja to draw 4 cards and put 3 cards from his hand on the bottom of his Deck. He then Special Summoned The Phantom Knights of Silent Boots and used Emergency Teleport to Special Summon Ghost Ogre & Snow Rabbit from the Deck! He used the 2 monsters to Xyz Summon another Dante, Traveler of the Burning Abyss! He activated Dante’s effect, detaching The Phantom Knights of Silent Boots to send Phantom Knights’ Fog Blade, Tour Guide From the Underworld, and another The Phantom Knights of Silent Boots to the Graveyard. He used a Silent Boots’s effect, banishing it from the Graveyard to add Phantom Knights’ Fog Blade from his Deck to his hand. He then discarded Cir, Malebranche of the Burning Abyss to Special Summon Beatrice, Lady of the Eternal over Dante! He Set 2 cards to the back and in the End Phase, he used Scarm, Malebranche of the Burning Abyss’s effect to add Graff, Malebranche of the Burning Abyss from his Deck to his hand. In Stephenson’s Standby Phase, Brown activated Beatrice, Lady of the Eternal’s effect, detaching Dante to send Fairy Tail – Snow from his Deck to the Graveyard. He used Dante’s effect to add Cir back to his hand. Stephenson activated Mythical Beast Master Cerberus and tried to use the effect, but Stephenson Chained Magical Spring! Brown drew a card and discarded Cir. Master Cerberus couldn’t destroy itself so he couldn’t add Mythical Beast Jackal King to his hand! Cir’s effect allowed Brown to Special Summon Dante from the Graveyard! Stephenson activated Abyss Actor – Curtain Raiser in the other Pendulum Zone and used the effect to have it Special Summon itself from the Pendulum Zone. He Set a monster and passed. Brown activated Foolish Burial, sending The Phantom Knights of Ancient Cloak to the Graveyard. He used its effect, banishing it to add The Phantom Knights of Silent Boots from his Deck to his hand. He then banished Phantom Knights’ Fog Blade from his Graveyard to Special Summon The Phantom Knights of Silent Boots from his Graveyard. He then Special Summoned another Silent Boots from his hand then used the 2 monsters to Xyz Summon The Phantom Knights of Break Sword! He then activated Beatrice, Lady of the Eternal’s effect, sending Farfa, Malebranche of the Burning Abyss from his Deck to his Graveyard. Brown then used Fairy Tail – Snow’s effect, banishing 7 cards from his Graveyard to Special Summon it. He used Snow’s effect to turn Stephenson’s Abyss Actor – Curtain Raiser face-down. (He noted that he forgot Farfa’s effect.) He then used Break Sword’s effect, destroying it and Stephenson’s Abyss Actor – Curtain Raiser. Brown then used Break Sword’s Graveyard effect, Special Summoning the 2 Silent Boots and increasing their Levels to 4. He used both of them to Xyz Summon Dark Rebellion Xyz Dragon! He then used Saryuja Skull Dread’s effect, Special Summoning another Farfa from his hand which was destroyed due to non-Burning Abyss monsters on the field. Farfa’s effect banished Stephenson’s face-down monster and that was enough to force the concession! Stephenson elected to go first in Duel 2. He placed Astrograph Sorcerer in the Pendulum Zone and used the effect to destroy it and Special Summon Stargazer Magician from his Deck. He then activated Star Pendulumgraph then Normal Summoned Purple Poison Magician and used the two monsters to Link Summon Heavymetalfoes Electrumite! He used Star Pendulumgraph’s effect and Heavymetalfoes Electrumite’s effect. Heavymetalfoes Electrumite kicked Astrograph Sorcerer from the Deck to the Extra Deck and Star Pendulumgraph’s effect added Wisdom-Eye Magician from the Deck to his hand. He then activated Wisdom-Eye Magician and Oafdragon Magician, then used Wisdom-Eye Magician putting Harmonizing Magician in its place and Heavymetalfoes Electrumite’s effect drew him a card. He then used Heavymetalfoes Electrumite’s effect targeting Harmonizing Magician, destroying it and adding Astrograph Sorcerer from the Extra Deck back to his hand, allowing him to Special Summon it and add another Wisdom-Eye Magician from his Deck to his hand. He activated it, using Oafdragon Magician’s effect to add back Harmonizing Magician from the Extra Deck back to his hand. He then used Wisdom-Eye Magician, destroying it to put Black Fang Magician in its place. He then Pendulum Summoned Wisdom-Eye Magician and Purple Poison Magician from the Extra Deck along with a Harmonizing Magician from his hand. he used Harmonizing Magician’s effect to Special Summon Purple Poison Magician from his Deck. Next, he used Purple Poison Magician and Wisdom-Eye Magician to Xyz Summon Timestar Magician! He used the effect, detaching Purple Poison Magician to add Astrograph Sorcerer from his Deck to his hand. Next, he used Heavymetalfoes Electrumite and Timestar Magician to Link Summon Zefra Metaltron! Then, he used Harmonizing Magician and Purple Poison Magician to Link Summon another Heavymetalfoes Electrumite! He used Heavymetalfoes Electrumite’s effect to send Mythical Beast Jackal King from his Deck to the Extra Deck. Next, he used Heavymetalfoes Electrumite’s effect, destroying Black Fang Magician and adding Mythical Beast Jackal King from his Extra Deck to his hand. He then used Black Fang Magician and Astrograph Sorcerer’s effects, Special Summoning Purple Poison Magician from the Graveyard and adding Black Fang Magician from his Deck to his hand. He then used Astrograph Sorcerer and Purple Poison Magician to Special Summon Supreme King Dragon Starving Venom from the Extra Deck! He used its effect to copy Heavymetalfoes Electrumite’s effect then used the copied effect, destroying Oafdragon Magician and adding Astrograph Sorcerer from his Extra Deck back to his hand. Astrograph Sorcerer’s effect activated, Special Summoning itself and adding the third Wisdom-Eye Magician from his Deck to his hand. He then activated Mythical Beast Master Cerberus’s effect, using it to add Mythical Beast Jackal King then activating it, then destroyed it to Special Summon Mythical Beast Master Cerberus from the Extra Deck. He used Mythical Beast Master Cerberus and Supreme King Dragon Starving Venom to Xyz Summon Number 38: Hope Harbinger Dragon Titanic Galaxy! He then used the two Astrograph Sorcerers to Xyz Summon Odd-Eyes Absolute Dragon. 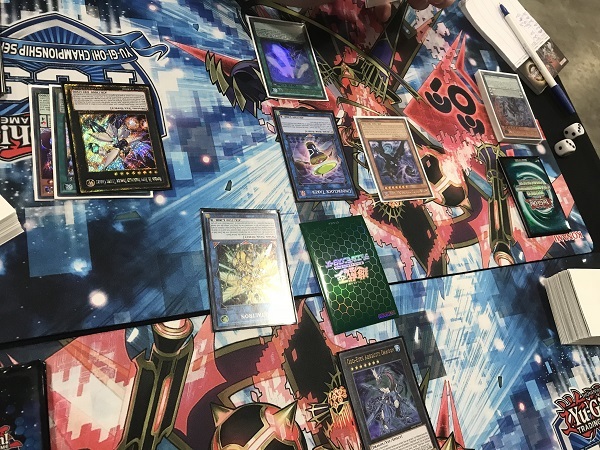 He then sent Odd-Eyes Absolute Dragon and Heavymetalfoes Electrumite to the Graveyard to Link Summon Underclock Taker and then used Odd-Eyes Absolute Dragon’s effect to Special Summon Odd-Eyes Vortex Dragon! Brown drew for turn, holding Magical Spring, Pot of Desires, Monster Reborn, Soul Charge, Radian, the Multidimensional Kaiju and Solemn Strike. He activated Pot of Desires, banishing the top 10 cards of his Deck. Stephenson Chained Ash Blossom & Joyous Spring to negate it, leaving both of his visible negation abilities active. Brown then Special Summoned Radian, Tributing Stephenson’s Odd-Eyes Vortex Dragon. He then activated Magical Spring, but Stephenson used Number 38: Hope Harbinger Dragon Titanic Galaxy’s effect to negate it and attach the Spell as an Xyz Material. Brown then used Monster Reborn to take Stephenson’s Odd-Eyes Absolute Dragon from his Graveyard. Brown attempted to attack Stephenson’s Zefra Metaltron but Stephenson used Number 38: Hope Harbinger Dragon Titanic Galaxy’s effect, detaching a material to redirect the attack to Number 38, and that was enough to force a concession. We’re going to a third and final Duel! Brown elected to go first. 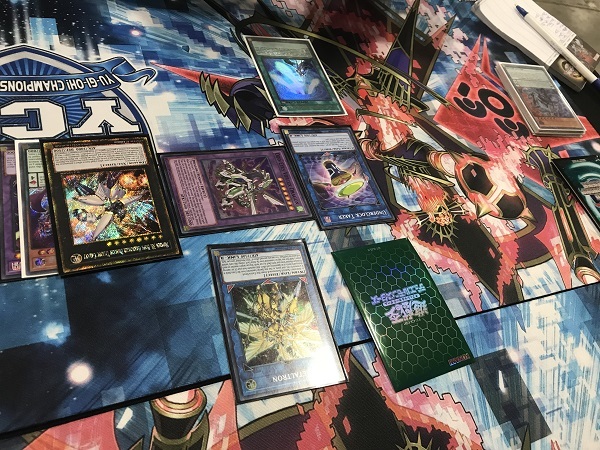 He started with a hand of Barbar, Malebranche of the Burning Abyss; Magical Spring; Cosmic Cyclone; Cir, Malebranche of the Burning Abyss; and The Phantom Knights of Silent Boots. He Special Summoned Barbar, then Normal Summoned Cir, Malebranche of the Burning Abyss. He used the two monsters to Xyz Summon Dante, Traveler of the Burning Abyss! He used its effect, detaching Barbar to send Heavy Storm Duster, Phantom Knights’ Fog Blade, and Libic, Malebranche of the Burning Abyss to the Graveyard. He Set Cosmic Cyclone and Magical Spring and passed. Stephenson activated Mythical Beast Master Cerberus and activated the effect but Stephenson chained Magical Spring! Brown drew Solemn Strike and discarded The Phantom Knights of Silent Boots. Stephenson continued by activating Harmonizing Magician as a Pendulum Spell, but Brown Chained Cosmic Cyclone to banish Harmonizing Magician. He Set a monster and passed. Brown drew another Solemn Strike. Time was called here. Dante, Traveler of the Burning Abyss’s effect detached Cir, Malebranche of the Burning Abyss and sent Fiendish Rhino Warrior, The Phantom Knights of Silent Boots, and Scarm, Malebranche of the Burning Abyss from his Deck to the Graveyard. 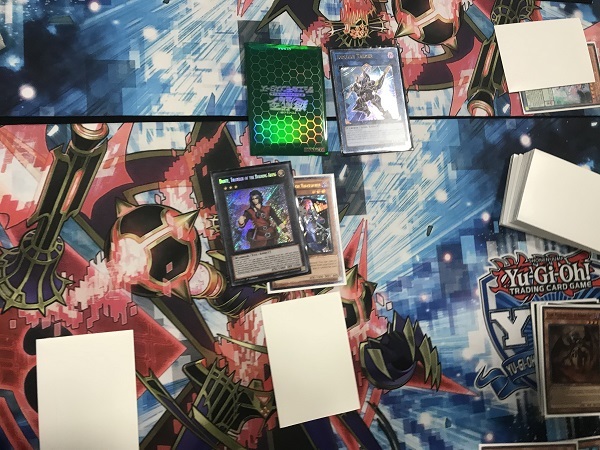 He used the effects to send Graff, Malebranche of the Burning Abyss from the Deck to the Graveyard and Cir, Malebranche of the Burning Abyss’s effect Special Summoned Barbar, Malebranche of the Burning Abyss from the Graveyard. Graff, Malebranche of the Burning Abyss’s effect Special Summoned Libic, Malebranche of the Burning Abyss from the Deck. He activated The Phantom Knights of Silent Boots from the Graveyard, banishing it to add Phantom Knights’ Fog Blade from his Deck to his hand. He turned Dante to Attack Position, then Dante, Traveler of the Burning Abyss attacked into the face-down, destroying Stephenson’s Rescue Hamster by battle. 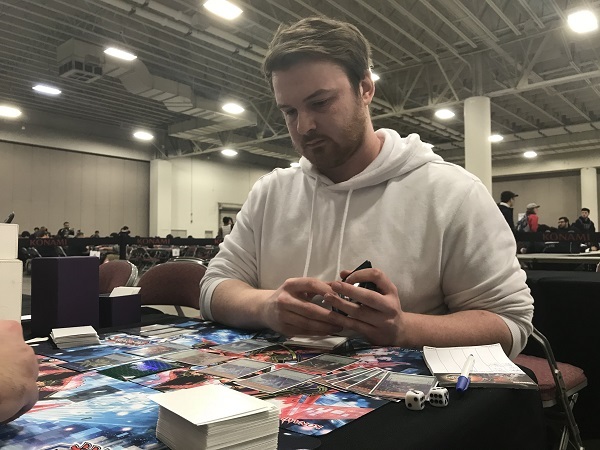 Libic, Malebranche of the Burning Abyss and Barbar, Malebranche of the Burning Abyss attacked directly, leaving Stephenson at 5000 LP to Brown’s 7000 LP. Brown Set 2 copies of Solemn Strike and Phantom Knights’ Fog Blade. In the End Phase, Brown used Scarm, Malebranche of the Burning Abyss’s effect to add Tour Guide From the Underworld from his Deck to his hand. Stephenson used the effect of Mythical Beast Master Cerberus one again, this time it went through and Stephenson added Mythical Beast Jackal King from his Deck to his hand. He activated Jackal King and used its effect, destroying it to Special Summon Mythical Beast Master Cerberus from the Extra Deck. He placed Rescue Hamster in the Pendulum Zone and then a second Rescue Hamster in the other Pendulum Zone, giving Mythical Beast Master Cerberus a total of 4 Spell Counters! He activated its effect, targeting Barbar; but Brown Chained Solemn Strike! Brown dropped to 5500 LP, keeping the lead and removing a huge monster from Stephenson’s field! He Set a monster and passed. Brown drew Phantom Knights’ Fog Blade. This is his last turn. He used Dante, Traveler of the Burning Abyss, Libic, and Barbar to Link Summon Decode Talker! He used Barbar’s and Dante, Traveler of the Burning Abyss’s effects: Barbar’s effect banished 2 copies of Libic, Malebranche of the Burning Abyss and a Graff, Malebranche of the Burning Abyss to burn for 900 points of damage and Dante’s effect added the Cir, Malebranche of the Burning Abyss in his Graveyard back to his hand. He then Normal Summoned Tour Guide and used the effect to Special Summon Fiendish Rhino Warrior from the Deck. He used the two monsters to Xyz Summon another Dante, Traveler of the Burning Abyss, and its effect was activated, sending Farfa, Ghost Ogre & Snow Rabbit, and Pot of Desires to the Graveyard. Fiendish Rhino Warrior’s effect sent Scarm, Malebranche of the Burning Abyss to the Graveyard and Farfa banished Stephenson’s face-down monster, leaving him defenseless! After the Match, Stephenson revealed that he opened up triple Rescue Hamster! It’s a tough beat, but a well played Match! Tamir Brown moves on to the Top 16! Sunday’s Generation Duel Top 4! Check Out Which Duelists And Decks Are Dueling In The Top 16!